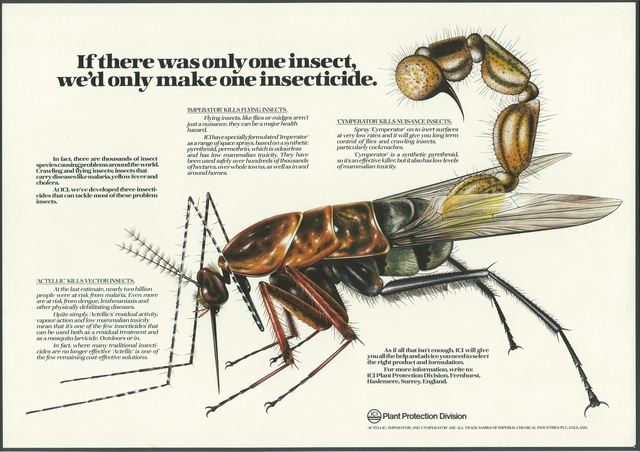 A 'blue-chip' advertising commission for ICI's international plant protection division. A product developed to kill all known 'harmful' insects: 'Actellic' kills vector insects; 'Imperator' kills flying insects; 'Cymperator' kills nuisance insects. The brief was to visually conceive a chimeric fictionalised organism comprising several parts taken from a number of what was considered unpleasant and harmful insects: I created a 'superbug'; the head of a mosquito, thorax and forelimbs of a cockroach, abdomen and wings of a housefly, tail and sting of a scorpion. Originally commissioned for international consumption during the 1980's this image has subsequently been published and debated extensively regarding certain ethical dilemmas that confront contemporary professional illustrators and visual communicators. A specific irony was presented and published as part of my keynote lecture at CONFIA 2015 International Conference in Portugal, April 2015 (ISBN: 978-989-98241-9-5)and in my book 'Illustration: A Theoretical and Contextual Perspective'2007 (ISBN 13: 978-2-940373-51-2)- none of the species I selected are harmful to crop/cultivated plants, in fact some scorpions feed exclusively on locusts!